Constantly stirs a pan over its head. Occasionally flips the pan, catches imaginary contents of the pan, and strikes a pose. Can be used as a cooking fire. The schematic is a world drop from Pandaria, and will teach 5 different engineering recipes, including the pets Pierre and Rascal-Bot. Learning the schematic will also teach Jard's Peculiar Energy Source, a material required to craft both pets. Players do not have to be level 90 to acquire the schematic. It will take 15 days, since the Peculiar Energy Source has a 1 day cooldown. Recommend crafting a pair of Mist Piercing Goggles to help with GhostIron Farm. While farming Motes, you do have a chance to get Gahz'rooki to drop in Top left N. Barrens off Kor'kron mobs. Lil Leftovers and Pierre share many abilities and a core purpose... to control/restrict the actions of the other team. While they arn't damage based pets they each have their use based on their class ability. Leftovers can't be oneshot and Pierre has the ability to come back once. High fiber is a very unused ability that can negate DOTS and Unborn Val's abilities. You basically take their damage and make them have to wait for the CD to come back up. Food coma is very powerful! What I most appreciate about Pierre is that he lets me cook anywhere. As team support this guy is a star. Chop goes well in a bleed team. Heat Up is very nice against multi hit, stampede/flurry etc. Stench is a very annoying(for your opponent) debuff, even one miss and you have broken even casting it. High Fiber is just excellent, removing Haunt/CoD/Ice Tomb and so on, team wide! But(!) with only two quite weak attacks to chose from this guy needs teammates to do the real damage, it won't be able to go toe to toe with many pets. I really enjoy playing with Pierre. Great against pets with multiple hits/turn, use Heat Up they kill themselves. I havn't started to level my Pierre just yet, but he is my absolute favorte pet to have by my side (other than the mounted argent squire). He reminds me very much of Calcipher from Howle's Moving Castle! He is totally worth the mats and the daily cooldowns. Mine is not 25 yet but he seems like a great pet for PvP. He can cleanse buffs and debuffs off of your whole team (very cool looking ability imo), has two stun abilities, and with stench he can reduce the enemy team hit chance by 25% for 4 rounds. Pierre has the potential to leave your enemy stunned, sleepy, and flailing around only to hit nothing. All that and a cute little cooking fire too? I cant wait to level him up! My engineer has the mats to make this little guy now. I'm trying to decide on making him or going for sky golem. I have checked AH sites and I can't find any information on what he is selling for (I'm completely ok selling one and adding him to my collection in a month or so). Has anyone seen what he is going for? I do a lap of the Valley of the Four Winds a day to get ghost iron ore. From the Hollow to the West to the turtle pool to the East, in an oval shape. It takes about 15-20 mins and you get 7-8 stacks of ore. Once smelting/transmuted it's enough for the daily cooldown for the engineering mat, and the living steel. I'm saving mine for the Sky Claw though, I'd imagine Pierre/Rascal Bot will be cheap on my server. Just made Pierre and the rascal-bot today, and both are not BoP and they are cagable after you learn them. Pierre is so cute! Can't wait to level them! I just made my first Pierre. The crafted item *is* tradeable. I'm not certain about the battle pet after it has been learned. It might work the way Red Cricket does, where the item is tradeable, but the pet is not. His swimming animation is adorable. His arms turn upside down to look more like a swimming motion and his "feet" twirl like a propeler. I only wish a puff of steam would come out when he jumps in the water. Made mine today (I can wait for sky golem). He's adorable! As for the ore mining, I started planting the mining seeds at the farms of a couple of my characters. I get alot of black trillium from the seeds and a fair amount of white trillium that I haven't had to go farming or transmute. If you're not using your farm for rep, cooking, or songells, this is a decent method of getting the mats. This requires level 600 Engineering to learn, and the patience to kill things/loot things until you recieve the info packet on Jard's crafting. 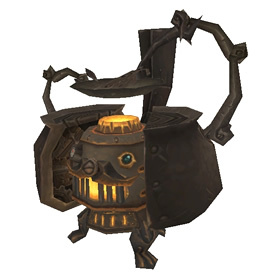 Using said item will teach you Pierre, Rascal Bot, and Jard's Peculier Energy Source. You need 15 J.P.E.S and 15 Living Steel to make Pierre and/or Rascal Bot. If you have an alt (or friend) with Alchemy, you can use the Transmute: Trillium Bar and Transmute: Living Steel to your advantage. Takes 3k Ghost Iron Bars that way.